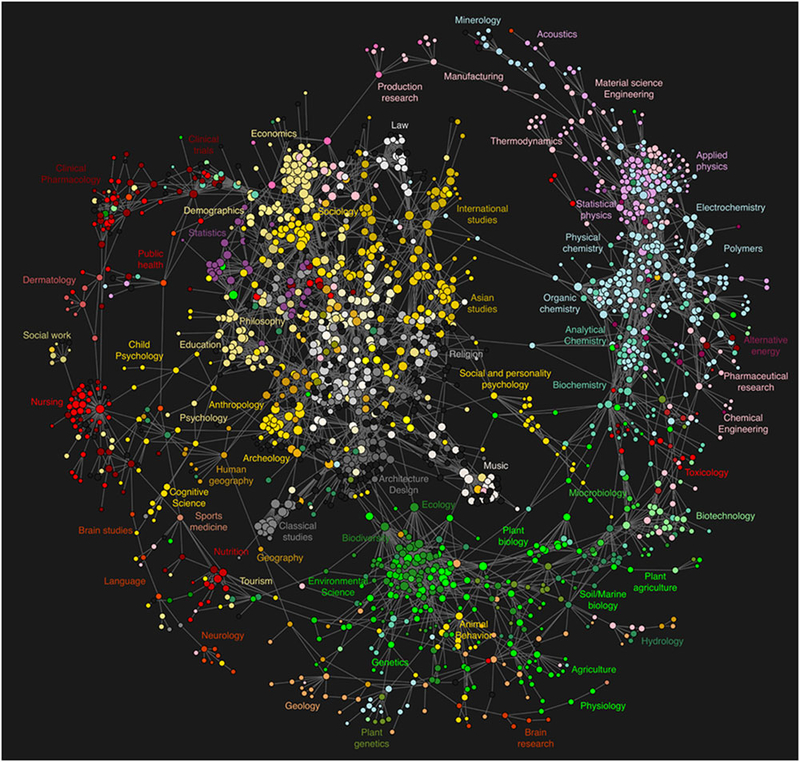 It is based on electronic data searches in which users moved from one journal to another, thus establishing associations between them. This is for german folks mostly: The Vieweg+Teubner publishing company is going to put a “Branchenindex Energie- und Umwelttechnik” online. My understanding is that this will be an online database containing addresses of companies in the fields of water-/sanitary- engineering, recycling, and renewable engery. Supposedly the service will be online starting in May 2009. See announcement and main site. Die Tageszeitung also reports how two people who enrolled a poster with the words “no riski damns” were escorted by police out of the venue of the congress, held in custody over night unsure about the reasons of the custody, and finally sent back to their home-countries, Germany and USA. Are you reading daily news? Where? Currently, the 5th World Water Forum takes place in Istanbul. Its subtitle is “Bridging Divides for Water” hinting at the necessary turning point for water resources: making drinking water available for everybody. It seems like the geographic location of Istanbul might be a proper choice for that theme. There are six main themes, around which sessions are grouped: “Global Change and Risk Management”, “Advancing Human Development and the MDGs”, “Managing and Protecting Water Resources”, “Governance & Management”, “Finance”, and “Education, Knowledge and Capacity Development”. Additionally, there is a big exposition with booths from participating countries and companies. There are “high level panels” on “water and disasters”, on “local financing”, on “water, food, and energy”, on “sanitation”, and on “water and climate change”. It’s organised to look like a UN-type event but it’s not. […] It’s really just a big trade show put on by the big water companies. There is going to be no mention of water as a human right. They don’t want to support that because they see water as a commodity to be sold on the open market. There is mounting evidence that privatisation has failed. We believe water should be a public trust. Maude Barlow is also member of the organizing committe of the “Alternative Water Forum“, which also takes currently place (March 20 to 22), also in Istanbul. I had written previously about the environmental conditions during the Olympics in Beijing. 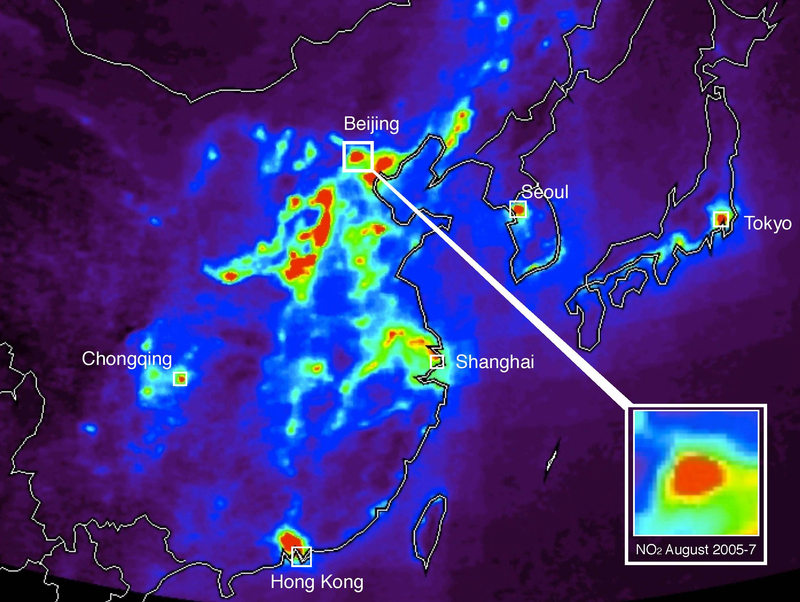 Real Climate points to a study which compared NO2 levels in the atmosphere in China before and during the Olympics. 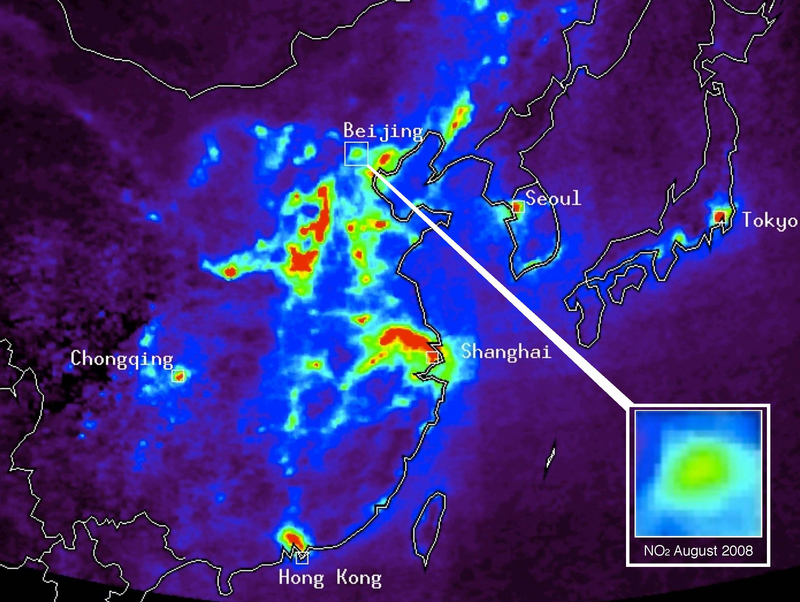 China had announced to regulate pollution more strict during the Olympics than before or after. Please update your RSS readers! I am sorry for any inconvenience this might cause! Recently, I ran into the word geoengineering quite frequently. I kind of thought of it as a form of geotechnical engineering, but it seemed like the things that were talked about had not very much to do with geotechnical engineering. Geoengineering: manipulate the Earth’s climate to counteract the effects of global warming from greenhouse gas emissions. Planetary engineering is the application of technology for the purpose of influencing the global properties of a planet. The goal of this theoretical task is usually to make other worlds habitable for life. Geoengineering ti the application of planetary engineering techniques to Earth. One of the blog posts I came across recently which talk about geoengineering was a post by Miriam Goldstein at The Oyster’s Garter. She discusses the risks and benefits of geoengineering, especially a type of geoengineering called “iron fertilization”. This proposal involves “deliberately stimulating plant growth in the ocean with the aim that the excess material will be permanently sequestered in the deep sea. This would remove carbon from the atmosphere”. For German speaking readers, here is a nice summary. Other types of geoengineering she discusses include stratospheric aerosols, cloud whitening, atmospheric carbon capture, and geochemical carbon capture. Map showing chlorophyll a concentration in the ocean at the are where iron was applied (circled) and in the vicinity of that area. Another set of measurements made available by the Alfred Wegener Institute are depth profiles of dissolved oxygen, silicate, ammonium and chlorophyll taken at two different moments in time: before the iron was put in place and four days after. Again, I am not a biologist or oceanologist, but the changes do not seem extremely high. But then, it’s only after four days. Concentration profiles of relevant aqueous concentrations before (red) and after (blue) the iron was brought out. To conclude, I guess it’s too early to conclude if the experiment was successful or not. However, it seems a very risky and monetary intensive experiment. As Lenton and Vaughan write, geoengineering really only makes sense as a part of a larger strategy that includes cutting back hard on greenhouse gas emissions. Wired reports on a “Carbon Burial” project, also referred to as “geological sequestration”, that will deposit a million metric tons of carbon dioxide into the ground by 2012. This is such a hot topic, it probably deserves an individual post. Drillers accidentally hit a pocket of molten rock underneath a working geothermal energy field in Hawaii, a lucky break for geologists that could allow them to map the geological plumbing that created everything we know as land. update Wednesday; April 15, 2009: Wired has an article from a researcher on board a boat in the southern ocean. Balazs Gardi is the winner of the “Pictures of the Year International” competition in the category “Global Vision Award“. Winning photograph at the Pictures of the Year International Competition. My project aims to examine the lives of people directly impacted by these developments, to search for solutions and coping strategies, and to encourage reflection on an issue of global scale that requires concerted local action.